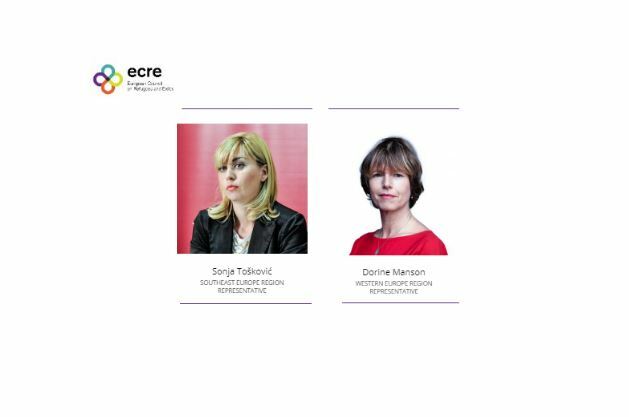 The ECRE Board welcomes two new members: Sonja Tošković, incoming Executive Director at Belgrade Centre for Human Rights and new ECRE Southeast Europe Representative and Dorine Manson, Chair and Managing Director of the Dutch Council for Refugees and new ECRE Western Europe Region Representative. “I think the two new board members are illustrative of the diversity and strength of the ECRE membership, now representing 96 organisations in 40 countries. The Dutch Council for Refugees has been a leading organisation in the Netherlands for four decades providing practical integration support as well as legal support during asylum procedures and advocacy on behalf of refugees and asylum seekers. The Belgrade Centre for Human Rights is one of the most important human rights organisations in South East Europe, currently playing a key role in advocating and defending the rights of refugees and asylum seekers, providing direct assistance and research,” says ECRE Secretary General, Catherine Woollard. Dorine Manson gave the following statement on the main challenges in the protection of the rights of refugees, asylum seekers and migrants at national, regional and European level and the role of ECRE as a pan-European Alliance with 96 member organisations in supporting their rights. “I see a big challenge for ECRE and its members to stand up against polarisation in our societies on the subject of refugees and the fact that a far-right minority has been allowed to dominate the discourse beyond their numbers. Sadly politicians at EU and Member State level are anxious to show political leadership, stand up for human rights and particularly the protection of refugees, asylum seekers and migrants. There is a lack of solidarity across EU and Member States are unwilling to share the protection responsibility as well as a lack of international solidarity with countries that host more than 90% of the worlds forcibly displaced. Among them some of the poorest and most unstable regions on the planet. Solutions can be found in substantial extra resettlement in Europe, legal pathways (easier family reunification, humanitarian programs), but the precondition to implement these solutions is political will, vision and courage.